I am writing with my eyelids heavy with an impending nap. It’s about 3 in the afternoon on Saturday. We got up early this morning and watched the ship dock here in Kusadasi, Turkey. Houses, shops, hotels, and apartment buildings stagger up the steep hills rising from the water. We slipped in neatly between a massive Disney cruise ship and another from a line I’d never heard of. They dwarfed us on the Seabourn Quest with its 450 of so passengers. There were thousands of people milling around out there almost immediately. Wherever they were going, we decided to go somewhere else. First we decided to take our workout off the ship and fast walked a couple of miles along the shore (definitely not a lot of competition from the cruising hordes on that activity!) 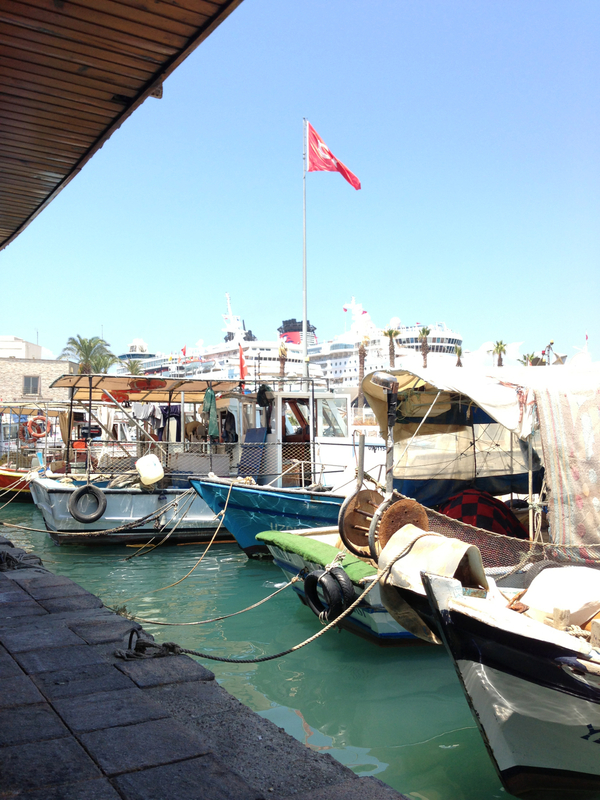 Kusadasi is really a happy-go-lucky seaside resort, with plenty of people at the beaches before 9 a.m. On the way back we ogled and coveted the private yachts along the docks. Cannot even imagine what those things must have cost. My consolation for being far too poor to own one is that they would probably just make me throw up anyway. That I have not yet gotten seasick on the Quest is a blessing, though it was a near thing last night. There we were, all dressed up in tux and evening gown, and staggering around like drunks as the ship rolled in what the captain called “a little motion in the ocean.” Cute. Anyway, I digress. The fish markets we passed this morning were stunning. The variety and freshness of the fish they pull out of the water right there just knocked our sweaty socks off so we decided to forego lunch on the ship for a seaside fish restaurant. We went back to consult with someone on ship about where to go, and returned to shore, dodging the magic carpet sellers and Turkish Delight stalls. The Kazim Usta Restaurant is right outside the duty free zone where the ships dock. We had seen it on our morning walk and it definitely had the freshest fish — all clear eyes and shimmering scales, lined up on the ice outside the place. 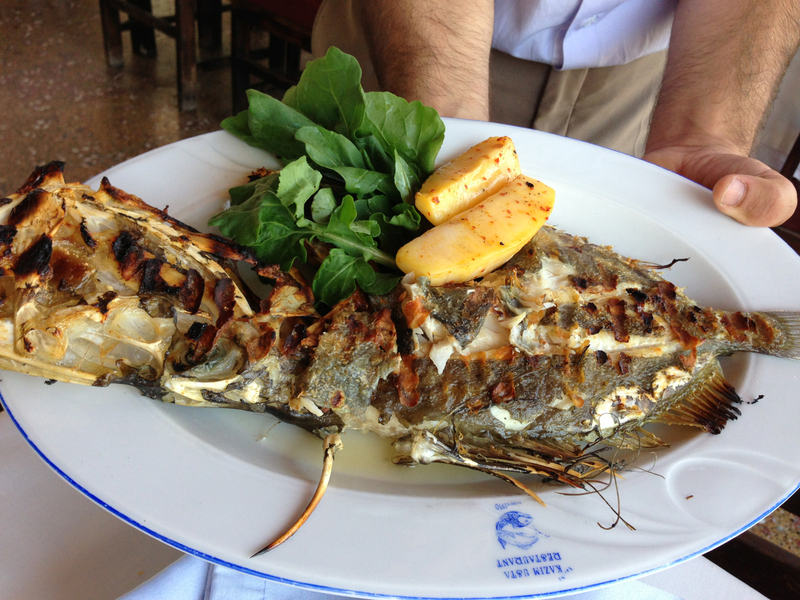 We picked our fish — a one kilo John Dory — and ordered it grilled. 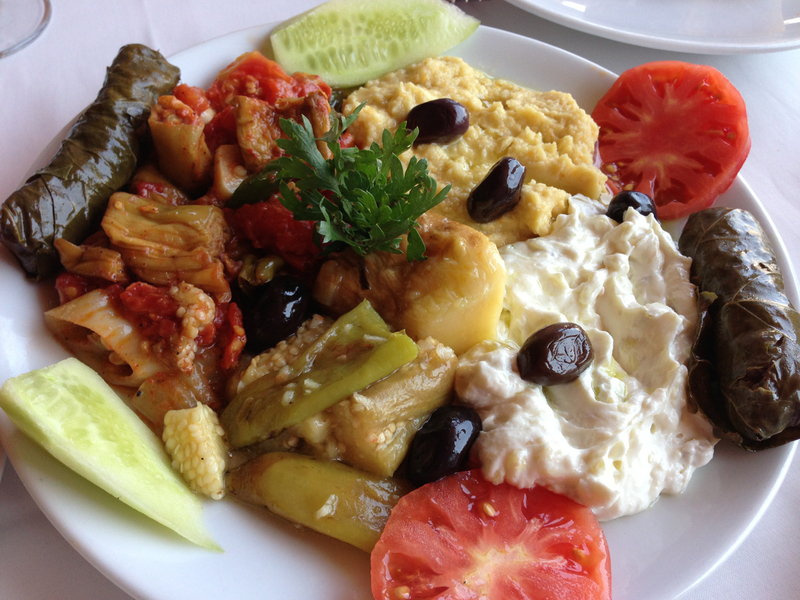 Meanwhile we picked a “few” meze items to start. There were several (okay, four) with eggplant, which I am constitutionally incapable of turning down, so we had all those, plus some stuffed grape leaves, a fava bean spread, and some fried calamari for Jer. We sat at a table under an awning along the dock, next to fishing boats, a little tired and worn but looking beautiful with the dappled sunlight dancing over the painted hulls. 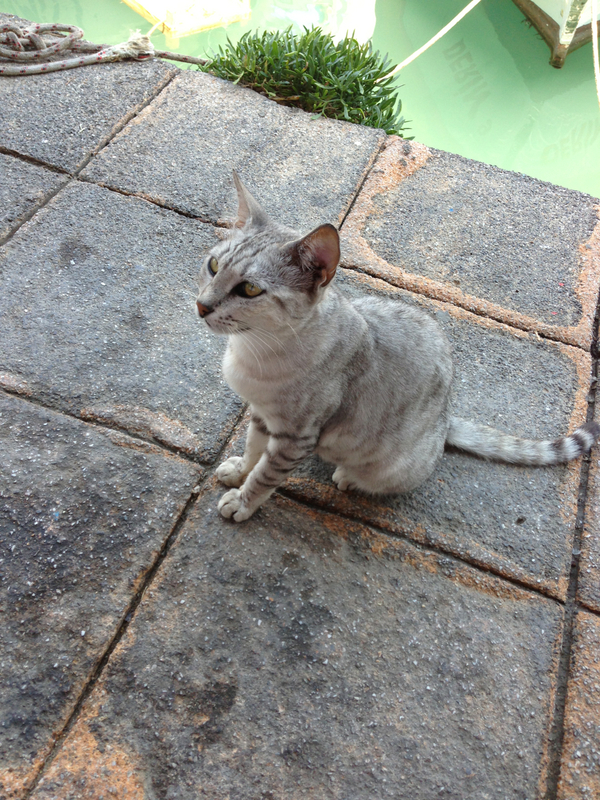 Cats, the oddest silver grey color, slinked around (slunk?) waiting for fish tidbits to fall. None did from our table. We ate every scrap and it was all fabulous. One eggplant salad had big chunks of roasted eggplant simply dressed with olive oil, lemon, and chilies. One was roasted and shredded in thick yogurt. One was braised in a spicy tomato sauce. And the final one was hollowed out and stuffed with tomatoes, eggplant, onion and pine-nuts. So, so good, all sopped up with chewy white bread. The fish arrived on a platter, grilled til it was charred with its skin split and curling back from the sweet white flesh. They filleted it at the table and served it with lemon olive oil sauce. Fresher than fresh and just delicious. Totally stuffed, we had baklava and Turkish coffee for dessert because, what the hell. Then we stumbled back to the ship, where Jerry is snoring contentedly and I am about to join him. Really, a perfectly perfect afternoon.